Can you elaborate where you get the bar code on your phone ? Do they send it to you ? And you had to hand your ID to the clerk at the post office also ? Isn't there an option to go to a Meridian credit union instead ? Are you saying that you have to have a smartphone to open an account with motus? Unfortunately, there is a sizeable population who don't have the tracking or the restraint to only charge what can be paid off when the bill comes. They are the target audience for this Interac Debit Christmas commercial. I think I'm not part of motus' target group. I am not interested in debt or debit! It says something about our society, that this is where the "growth" area may be in banking. They send you an email at the end of the signup process. This email has your personal barcode in it. So it is easiest to just show this email on you cell phone. No, you do not need a cell phone for you can just print out the email and take that with you. Do not recall an option to go to Meridian.....same company but different bank entity. $150 loan offer*, just for keeners like you. Only for those who signed up for their emails. I’ll look into it and report back. This is on par with what I was expecting. Their main competition will be Alterna Bank (owned by Alterna Savings & Credit Union Ltd), Motive Financial (owned by Canadian Western Bank), EQ Bank, Oaken Financial, and the aforementioned Tangerine and Simplii. They're offering a slight premium on registered GIC and savings account rates, which I've always thought makes strategic sense since it's harder to transfer out those funds. Also, the main focus of this expansion will be on mortgages outside of Ontario. I expect them to, eventually, enter the mortgage broker market (if they're not already) and to expand their share of directly-sourced mortgages outside of Ontario (if Meridian is in the mortgage broker market already). So, they really do want mortgages - that's their prime competition. Note also that they've done a number of hundred million dollar plus equity raises, past credit union deposit promotions, so they're likely sufficiently capitalized and want to grow their revenue. As someone who doesn't yet own an Oaken or an EQ Bank account, Motus is compelling in the sense that they're offering something that is equal to those two (and Alterna). They're also slightly better than Motive Financial all around in the sense that the savings account deposit rate is not tiered and also in terms of no transaction fees on the savings account. Motive should've just changed the features of existing accounts instead of launching their lamely named "Cha-Ching" Chequing and Savings accounts. 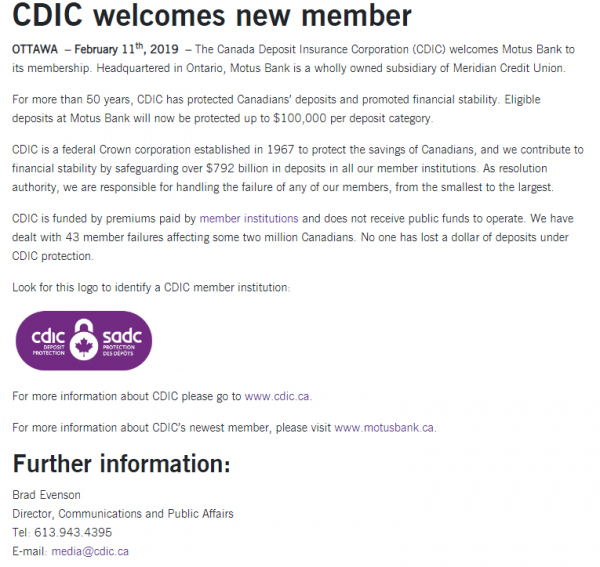 Depending on how things shake out with Coast, I may even potentially use Motus as my new primary chequing account since they also use MemberDirect, have e-Transfers, and bank-to-bank transfers. Coast doesn't offer me a lot of in-branch advantages other than depositing my HSBC USD dividend cheques (that's not especially significant - I could either keep my Coast USD chequing account for that, deposit in-branch at Scotiabank to my Scotia iTRADE USD brokerage account, or open a Motus USD account, if and when they launch one, and mail in my cheques). Are you one of those people that opens copious accounts just to get "free money" promo offers? From a business standpoint, it actually makes more sense to offer "free money" to borrowers. I assume it can't be for revolving credit (i.e., obtain an authorized line of credit but not borrow anything or borrow for only a day or two before the required end period of the loan holding period), but it's good that it includes personal loans and mortgages. The $150 would barely, if at all, cover appraisal fees let alone potential discharge fees at the losing FI (unless they're fully reimbursing for those separately from the promo), so I think they've got to have better "free money" offers for borrowers. Potentially, they could offer $100-150 per $5,000 amount borrowed, up to $50,000 borrowed, such that if you borrow a mortgage of at least $50,000, you'd get at least $1,000 cash back. That's what Coast and CIBC do. Not sure if those are "growth" areas. They may just be areas of business that Meridian wants a bigger slice of. motusbank is a way for them get a bigger slice of those across Canada instead of just in Ontario. Yes, that's actually what I meant by "growth", Norman - not being a banker or economist etc. Speaking personally, the reason I am careful to use "AlternaBank" is simply in order to distinguish from the CU wihich has a very similar name. That is not true for Meridian/Motus, so I'm OK with just calling it motus. I'll be lucky if I even remember that much as I think it is an entirely forgettable and thus regrettable name. For those who are interested (not me), the loan deal might be worth it if there is no required term, i.e. if you can pay it off the next month. But, if not, then "no free lunch!". This must be where they expected to make money on our 3.75% GICs! TORONTO, April 2, 2019 /CNW/ - Starting today, every Canadian who has ever felt frustrated or underwhelmed by their banking experience has an entirely new and exciting option available to them. Allow us to present motusbank: a full-service bank providing Canadians with an exceptional digital service offering, as well as access to some of the most competitive rates and fees in the country. Isn't that what I said? They've been emphasizing in lending in their pre-launch marketing. Out of province GICs will provide some opportunity for growth, but only needed and to offer a full spectrum of products. I've been impressed so far by the breadth of products Motus Bank is offering right out of the gate. So many upstart banks start with a single product, with limited features, then build out their functionality. I see they even have RRIFs (though that requires a paper-based application to be submitted, presumably, by scan & e-mail, fax, or snail mail). The fact they have unsecured and secured line of credits is also impressive. I think their slogan should be, "At last! a bank for spenders!" How clever of them. It will probably work. That's a lucrative market. - they have Me-to-Me Transfers including a slick paperless account linking process. Coast has none of those. In terms of marketing firepower, they seem to have a bigger ad budget than CWB has for Motive Financial and Alterna has for Alterna Bank, so I think they've got an edge there. Their toughest competition will likely be EQ Bank, but then again, maybe not as EQ Bank doesn't have joint accounts (nor credit facilities in the direct-to-consumer channel). No, I actually meant what I said. I was confused by what others were reporting. Where I get my hair cut, they take credit cards. Have been going to the same person for about 25 years, so not likely to change any time soon. I carry cash, and find it simpler than learning a new trick, considering how often I use it, which is not very often. No doubt it's a sign that I'm getting old. I won't use interac ot e- unless forced, but I don't think that will be any time soon.